The death of B. 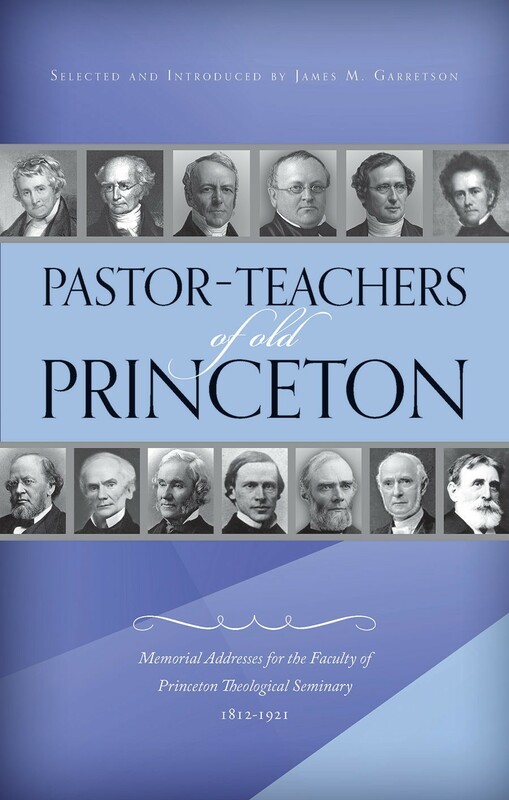 B. Warfield in 1921 effectively marked the demise of the old Princeton Theological Seminary, for it was ‘reorganised’ in 1929 along liberal theological lines, but for 110 years its aim had been to produce godly pastors and faithful teachers of God’s Word. This volume* commemorates the efforts of the pious and gifted instructors of those years, who combined personal piety and doctrinal orthodoxy. The one feeds off the other. There is the ever-present danger that we might divide what God has joined, namely an intelligent knowledge of the divine truth and an experiential knowledge of spiritual realities. The teachers of Old Princeton did not fall into that error. The sermon preached after the death of Archibald Alexander (1851) has as its text Philippians 3.17 (‘Mark them which walk so as ye have us for an example’), and the example he left was a life of humble service, godly wisdom and constant labour for the Lord as college principal, pastor, preacher and the first professor at the seminary. The second professor, Dr Samuel Miller, was a controversialist but no bigot, combining strong conviction with courtesy and a love of peace. J. W. Alexander taught for a short time at the seminary but spent most of his lifework was as a pastor and preacher, whom his congregation never tired of hearing, month after month, year after years. He said, ‘To be a great preacher a man must be nothing else’. He taught gospel truth and practised gospel charity, and he is quoted as saying: ‘The greatest heresy is want of love’. Of special interest to me is the famous Old Testament scholar, J. A. Alexander, who was 25 years a professor and died at the comparatively young age of 51 years (as did his brother just mentioned). He knew about 20 languages, and his two volume Commentary on Isaiah is justly famous. For all his erudition, he had a childlike trust in the truth of Scripture. Charles Hodge was teacher at the seminary for 58 years, and his three volume Systematic Theology is still in print. Would that it could be said of every theological professor what was said of Hodge: ‘The truth which he thought, was the truth upon which his soul lived.’ He was perhaps the seminary’s greatest teacher, and almost 100 pages of this book are devoted to him. It was said of him, ‘He could not be idle’, as evidenced by his voluminous writings, but for all his study and learning, ‘he brought to the study of the Bible the humility of a little child’. Henry Boardman was pastor of the famous Tenth Presbyterian Church, Philadelphia, and ‘he was well aware that power in the pulpit is the result of labour in the study’. He occupied that influential pulpit for more than 40 years. A. A. Hodge succeeded his father in the chair of Theology, but died only 8 years after his father. It was his gift to popularise theology, as shown by his Outlines of Theology and his Commentary on the Confession of Faith. Like his predecessors, he had no peculiar views and did not try to innovate for the sake of it. In other words, the men of Old Princeton avoided the common danger of the theologian, namely to think you have to say something novel to be noticed and listened to. James C. Moffatt started as a shepherd boy in Scotland and rose to become Professor of Church History at Princeton. Casper Wistar Hodge spoke for the whole Princeton tradition when he stated: ‘Change is not necessarily advance’. He was a painstaking New Testament scholar, but wrote no books, for he was indifferent to fame and honours. William Henry Green taught Old Testament at Princeton for 49 years until his retirement in 1900. He held to the divine origins of Scripture and battled against the higher critical views about the composition of the Pentateuch coming into vogue at that time. William Paxton was a model preacher, and he became a professor of homiletics, showing his students what he was accustomed to do in the pulpit with such great success. His basic prescription for useful preaching was: ‘Work! Work! Work!’ He saw the whole point of the theological college as training preachers who saved souls. B. B. Warfield stayed home caring for his invalid wife and writing, and a constant stream of learned publications was the result. In his many articles he defended the Christian Faith and the supremacy of Scripture. Apart from that, he gave himself to teaching his classes and his last class was on the morning of the day he died. Old Princeton died with him, but a value of this book is that it gives lessons for those who would remain faithful to the Scriptures today. Taken with permission from Australia’s online magazine New Life, September 1, 2012.